In 1908 a mysterious stranger arrived in Ponca City on the train with nothing more than a cloth bag for his clothes and a letter of introduction to the owners of the largest ranch in the county. The stranger is thirty-four years old, says he is a lawyer from back east, and has come to prospect for petroleum. Dressed in a business suit and wearing spats and knickerbockers, the stranger looks a little out of place but he appears prosperous, confident, and impressive and no one in town can tell by looking at him that the stranger is living on borrowed money. Stores on Grand Avenue in Ponca City about the time E. W. Marland arrived from Pennsylvania to search for oil. Only 15 years have passed since the town was created from the empty prairie and the town's unpaved, dirt streets are lined with hitching posts for the horses and wagons on a main street lined by hardware stores, barbershops, dry goods stores, a carriage repair shop, and a bank in one of the town's few brick buildings. Residents pay a penny a barrel to get their water from a tower in the middle of main street. The federal census reported a population of 2,521 in 1910. 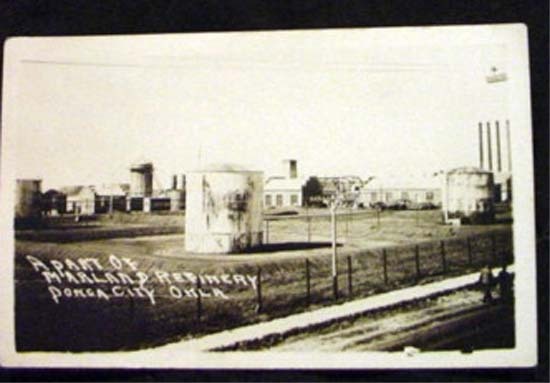 A photo of part of Marland Refinery in Ponca City, Oklahoma taken in 1919. The Marland Refinery provided employment for tens of thousands of workers over the next hundred years. Marland Oil Company provided health care and loans to employees to buy homes to make a better life. Grand Avenue. 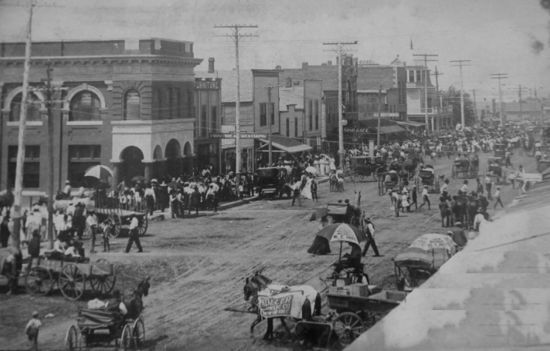 Within a few years of the stranger's arrival Grand Avenue is a crowded throughfare and the the population of the thriving city has almost tripled to 7,051 in 1920 after Marland discovers oil and builds the Marland Refinery. By the mid-1920's Marland has built a new headquarters building at the Marland Refinery and Grand Avenue in downtown Ponca City has been paved. Someone new to Ponca City asked me a few days ago why everybody in town made such a big deal about E. W. Marland. "Wasn't he the guy who had his oil company taken away from him in the 1920's?" he said. "Let me tell you a story," I replied. Imagine a frontier town one hundred years ago, just a few years after the territory of Oklahoma has become a state. Only 15 years have passed since the town was created from the empty prairie and the town's unpaved, dirt streets are lined with hitching posts for the horses and wagons on a main street lined by hardware stores, barbershops, dry goods stores, a carriage repair shop, and a bank in one of the town's few brick buildings. Residents pay a penny a barrel to get their water from a tower in the middle of main street. One day a mysterious stranger arrives in town on the train with nothing more than a cloth bag for his clothes and a letter of introduction to the owners of the largest ranch in the county. The stranger is thirty-four years old, says he is a lawyer from back east, and has come to prospect for gold - black gold of petroleum. Dressed in a business suit and wearing spats and knickerbockers, the stranger looks a little out of place but he appears prosperous, confident, and impressive and no one in town can tell by looking at him that the stranger is living on borrowed money. In a few days the stranger travels to the ranch and presents his letter of introduction to the owner and asks if he can prospect for petroleum. Soon the stranger is seen tramping the land around the ranch studying the outcroppings of rocks and walking for miles over the broad and rolling prairie carefully inspecting the rock formations. With a letter of credit for a drilling rig from backers back east, the stranger drills his first well near the ranch headquarters under the most adverse conditions. There were no heavy draft horses in the area, so he uses lumbering teams of oxen to haul rig timbers, tools, boilers, and casings from the railroad station in Bliss to the well location. They drill to a depth of 2,700 feet but abandon the well as a non-producer. After the first failure, a second promising location is identified about five miles away on a piece of land called the Iron Thunder Tract but conditions are even worse here than at the first well site. At a depth of 500 feet they strike gas in the spring of 1910 but there is still no sign of black gold. A third well is drilled 1800 feet from the second and it strikes gas too. Eight wells are drilled and each one is a failure. "George L. Miller was showing me around the Ranch one day and we rode up a hill to see the cemetery of the Ponca Indians. The Indians placed their dead on wicker platforms above the ground. I noticed by the outcropping of the rock on the hill that the hill was not only a topographical high but also a geological high. A little further investigation showed it to be a perfect geological dome." Convinced that there is an oil formation next to the Ponca Tribal Cemetery, the stranger tells Miller that he will drill a test well if Miller can help him obtain permission from the Native American tribe. He has run out of money but his friend Bill McFadden loans him money to drill one last well. After weeks in the field, his ninth well comes up dry just like the others. The stranger packs up his bags to leave. He has made enough money from his gas wells to pay off his debts and he returns east on the same train that brought him to Ponca City three years earlier. Returning to his hometown of Pittsburgh, Pennsylvania Marland opens a law practice and is very successful as a lawyer. 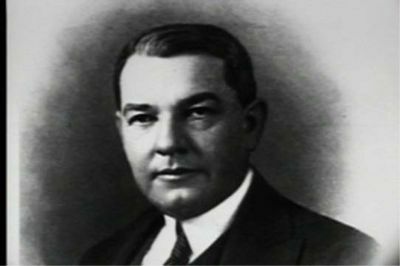 He eventually enters politics and twenty-five years after leaving Oklahoma, Marland is elected Governor of Pennsylvania in 1936. Years later after he retires from public life Marland sits down to write his memoirs and devotes a chapter to the frontier town where he had gone as a young man in search of riches and adventure and he remembers the generous way he had been treated by the townspeople of Ponca City. But what happened to the town after the stranger departed with his dreams unfulfilled? The sleepy little town of 2,500 people stayed a sleepy little town. Fifteen years after Marland leaves Ponca City, wildcatters discover oil at Three Sands and eventually come back to the 101 Ranch and drill again just a few hundred yards from Marland's last dry hole and strike oil. But time has passed Ponca City by. Instead of building a refinery in Ponca City, the oil men build a pipeline to Cushing, Oklahoma where the petroleum can be refined and sold across the country. 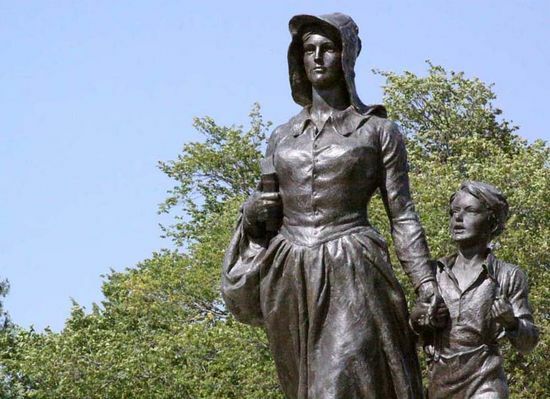 There was never any Pioneer Woman Statue in Ponca City, no Marland Mansion was ever built and no Marland Grand Home, no hospital built with funds donated by Marland, no children's home, no recreational facilities for company employees, no acre homes, and no company sponsored loans to buy them. But most importantly no Marland Refinery was ever built to provide employment for tens of thousands of workers over the next hundred years and provide an economic base to grow the small community. There was no Marland Oil Company to provide health care and loans to employees to buy homes and to make a better life. And there was no city at Ponca, just a sleepy little town that time and progress passed by. That's what Ponca City owes EW Marland and why we remember Marland today. Marland Oil Company was founded in 1917, when Marland assembled his various holdings including the 101 Ranch Oil Company into one unit, forming Marland Oil Company. Later, on January 3, 1921 Marland incorporated the Marland Oil Company in Delaware to acquire through an exchange of stock control of the Marland Refining Corp. and Kay County Gas Co. By 1920 it is estimated that Marland and his partners controlled 10% of the worlds oil production (the equivalent of Saudi Arabia in 2006) and that Marland was worth $85 million. In 1918 Marland began construction of the Marland Refinery and the population of Ponca City doubled then trebled in a few months. From the outset Marland realized that to sustain long-range corporate growth he must form an integrated company encompassing drilling and production, storage and transportation, and refining, and retailing, similar to the very successful model used by the Standard Oil Company. The first step in this process was to dissolve the 101 Ranch Oil Company and replace it with the Marland Refining Company. Over the next several years Marland expanded his empire to include production in neighboring states, and by 1919 he had even started large-scale drilling operations in Mexico. The next step in bringing the feverish rate of growth under a more centralized and integrated operation came in early 1921 when Marland consolidated all of his oil operations under the auspices of the Marland Oil Company. 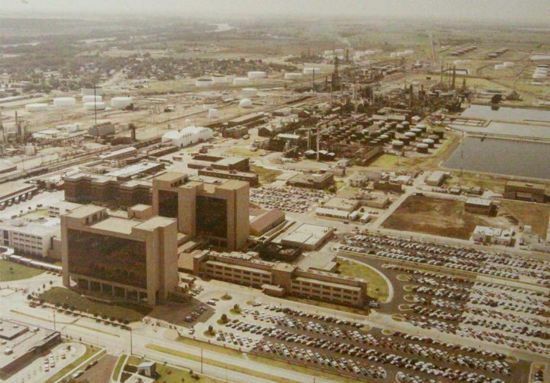 Headquartered in Ponca City, where its major refining facility was located, the firm continued its phenomenal growth pattern by absorbing numerous small oil companies such as Comar Oil Company, Tom Jones Oil Company, Kenney-Cleary Oil Company, Francoma Oil Company, John S. Alcorn Oil Company, and many others whose highly competent executives Marland's company usually retained. Additionally, the company opened its first retail gasoline "filling station" in Pawhuska, Oklahoma, in 1920, and that aspect of the business began to experience rapid growth. Marland took a strong, paternal interest in his company and in his employees and provided numerous benefits not normally offered in that era. 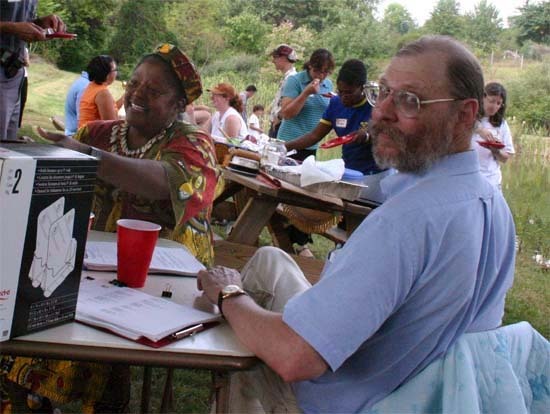 He furnished company housing at a nominal fee, provided free insurance to all employees, paid wages above the norm for the time, and is generally acknowledged to have provided the best employee benefits and working conditions in the state. Additionally, his donations to local charities and civic projects were enormous, and he sponsored legendary entertainment spectacles for both employees and the general public. Located in the heart of the Mid-Continent oil field, the greatest known light oil field in the world, by 1920 the company controlled, with its subsidiaries, over 200,000 acres of proven and valuable oil land within a radius of 100 miles from Ponca City, the headquarters of the company. A study of the map of Marland properties in Northern Oklahoma proves easily the strong strategic position the company holds through its oil resources and large reserves in some of the best pools of this district. Marland oil opened in 1920 the famous Hickman, or now better known as Burbank pool, in the Western Osage; in 1921 the Tonkawa pool in Noble County, within fifteen miles of Ponca City, which promises to produce large quantities of high-gravity crude. It controls almost entirely the Ponca field, one of the oldest and best producing fields in the Mid-Continent, with five producing sands; holds large parcels of oil and gas lands in the Eastern and Western Osage fields, in the Garber, Noble, Newkirk, Deer-Creek and in the Pawnee Payne district. Marland draws its crude from eighteen producing fields with 244 wells and produces, with its affiliated companies, the Comar and Alcorn Oil Companies, over 12.000 barrels per day, sufficient crude for its own refinery demand. Pipe lines extending 271 miles, with thirteen modern equipped pumping stations, radiate in three directions from Ponca City and connect Marland's two refineries with oil fields which have ample unmined production to supply sufficient crude oil for many years to come. The company operates in Ponca City a 10,000-barrel complete refinery, and at Covington a 1,000-barrel skimming plant producing a well-known brand of high grade gasoline and lubricating oils. Nearly two million barrels of steel storage for crude and finished products give the company a strong position in the market, and enabled Marland to begin the storage of gasoline when the refinery price was as low as 12-1/2 cents. The recent raise, totaling so far 3 cents per gallon has greatly increased the value of the 250,000 to 300,000 barrels gasoline the company keeps i» storage against the coming summer demand. By 1922 nearly 600 Marland stations were found in 11 mid-continent states, from North Dakota to Oklahoma and as far east as Indiana. Growth required capital, however, and Marland was continually strapped. Turning to investment banker J.P. Morgan and Company, Marland was able to secure financial backing for continued expansion, but with expansion came a hefty price. By 1928 Marland had been forced out by Morgan interests who placed former Texaco executive Dan Moran in charge. With orders from Morgan and Company to put Marland Oil back in the black, Moran set out to acquire key assets that would round out the Marland operation, allowing for increased financial stability. With this in mind, Marland management began to look around for a partner, a company with complementary assets, an operation that would perhaps consider a merger. Marland's exploitation of oil reserves generated growth and wealth that were previously unimaginable on the Oklahoma prairie, and his company virtually built the city from the ground up. Mansions—including the Marland Mansion and Grand Home—were built by Marland and his associates. The "Roaring 20s" came to an end for Ponca City shortly before the Great Depression. After the takeover bid by J.P. Morgan Jr., son of financier J.P. Morgan, Marland Oil Co. merged with Continental Oil Co. (Conoco) in the late 1920s. 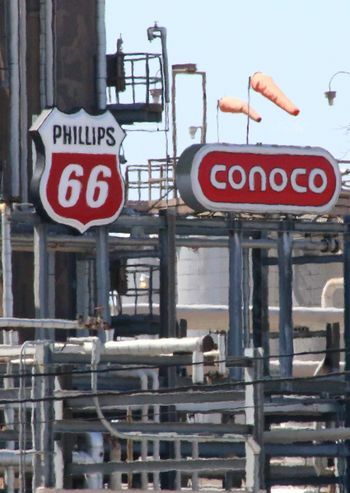 It was known as Conoco for more than 70 years. 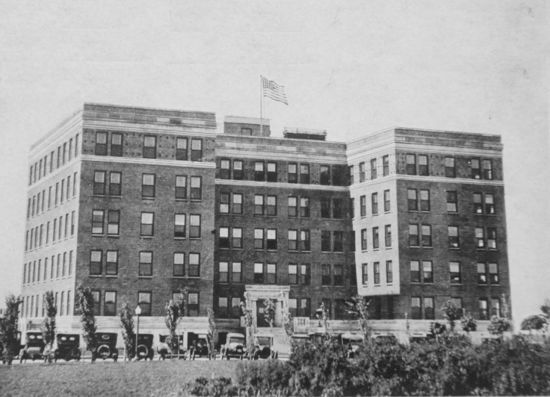 The company maintained its headquarters in Ponca City until the 1950s and continued to grow into a global corporation. Marland was later elected the governor of Oklahoma and as a U.S. congressman. ↑ Wikipedia. "Marland Oil Company"
↑ Inside Conoco. "The 101 Ranch Oil Company" page 4. published in 1967. ↑ Oklahoma Historical Society. "Marland Oil Company"
↑ Petroleum Age. "Marland Plans Plant Additions to Cost about $1,600,000" 1922. ↑ Conoco Inc. Company History at Conoco Phillips company website (retrieved March 2, 2010). This page was last modified on 6 April 2018, at 17:34.